The majority of American full sized vans that you’ll see on the road are Ford Econolines (also known as the Ford E-Series, or Ford Club Wagon). There’s a good reason for that: they’re the most powerful full sized vans on the market. Their maximum gross vehicle weight rating is 6,577 kg (14,500 lbs), which is more than enough for most purposes, and in fact, makes them a leader in their class. Their maximum front gross axle rating is just as impressive, at a class-leading 2,268 kg (5,000 lbs). They need good engines to carry all that weight, and boy do they have them. Depending on the model, you’ll get either a 4.6L EFI Triton V8 Engine, or a 5.4 EFI Triton V8 Engine. No matter the model, the car always has 4-speed automatic transmission. Of course, the amount of weight that a van can handle doesn’t matter too much if you can’t fit anything in it. 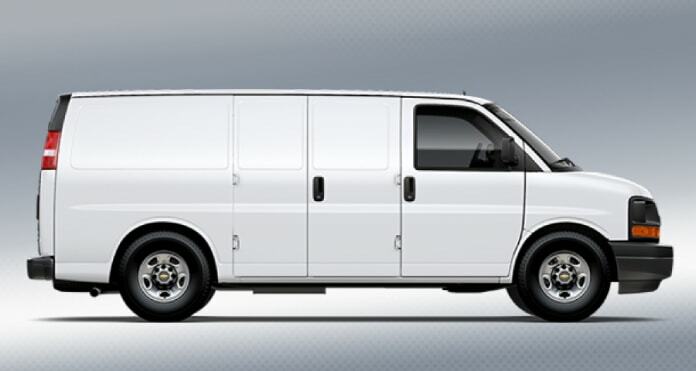 But the Econoline should also be sufficient for most cases, since it has 278.3 cubic feet for cargo storage. If that’s not enough, you can always hitch a trailer to it. The maximum loaded trailer weight is 10,000 lbs. The Ford Econoline also has AdvanceTrac with Roll Stability Control, which is an incredibly important feature for safety reasons, though many cars regrettably fail to include it. The US National Highway Traffic Safety Administration actually found that one-third of all fatal car crashes could’ve been stopped if this technology had been employed. Its biggest disadvantage is its fuel efficiency, which is pretty low at anywhere between 10-17 miles per gallon, depending on the model you’re driving and whether you’re in the city or on a highway. If this is the cargo van you want, then you’re in luck: most car rental places stock it. That makes sense, seeing as how it’s the most popular full sized van on the market.